As there is great significance of stirred vessels in thermo- and fluiddynamic processes (e.g. process engineering), mixture and stirring applications have already been under excessive investigation. Yet, all these examinations have been carried out under 1-g conditions and no transfer of the scientific achievements - that already found broad technical application on earth - into space relevant technologies has been made due to altered physics in space. A lack of buoyancy exists in orbit, which results in a dominance of surface tension and shear force. Despite of its potential value for space applications the field of research about stirred vessels under µ-g is rather unexploited. Filtration, dispersion, emulsifying and homogenising of various substances are useful examples for the utilisation of this technology. To make a contribution for research, our goal is to determine the optimum values for experimental parameters like agitator speed, gas flow rate and viscosity based on a defined geometry. The motivation for the experiment is to find out how much an increase of the stirrer speed results in a decrease of the medium bubble size and a significant narrowing of the bubble size distribution - as the system would react on earth. It is also possible that the injected gas is kept away from the blades due to the lack of buoyancy beneath a critical gas flow and agitator speed, which is going to be investigated, too. 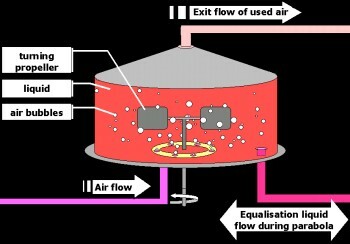 The behaviour at different operating points can be determined by varying the liquid viscosity and the gas flow. To correlate the scientific with the technical aspect, a dispersion of air in a special immersion-liquid is used for the experiment to draw conclusions about parameters like generated phase interface, location of the gaseous phase and other quantities. The test section consists of a cylindrical vessel, a Rushton-turbine and a nozzle for the air supply. The vessel is filled with a "immersion-liquid PMMA / TUM" with the viscosity of 76 mm2/s at 20 °C and the same refractive index as Plexiglas®. The nozzle-ring is mounted in the centre or the flat bottom of the vessel. The stirrer (d=40mm) is assembled according to DIN 28131 above the nozzle. Possible experiment parameters are agitator speed and gas flow rate. On both days of the Flight Campaign the gas flow rate is varied for each parabola. Immediate shutdown: In case of anomalies or emergency situations, gas flow and electrical power supply are shut down by a red emergency push down button. Further safety details are discussed in meetings with engineers experienced in 0-g experimentation from Astrium, Friedrichshafen (Dr.-Ing. Winter). The procedures are verified by ground experiments.